I’ve jumped into a whole new decade in 101 Horror Movies, and I’ve come across the first Hammer film on the list. Hammer is an iconic studio name for horror fans, churning out some classics, some not so classics, and always colorful posters that highlighted the terror of the monster, and the curves of the women that the monster sought out. This film also saw the beneficial pairing of Peter Cushing and Christopher Lee together! 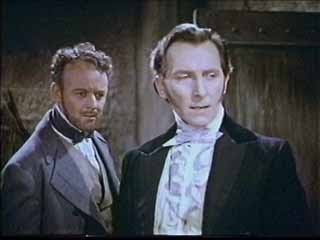 Cushing plays the more aptly named Baron Victor Frankenstein (much better than Henry) and Christopher Lee takes on the role of the Monster. From the get go, I liked this film better than the Universal one. It follows the story of Victor through flashback telling his tale in prison while he waits for aid and judgement. It also does a very nice job of setting up the mentor relationship between he and Paul (Robert Urquhart). When Victor is orphaned, Paul Krempe comes along as Victor’s teacher, and the two characters grow together, until the student exceeds the master, and starts toying with the idea of reanimating a corpse. While Karloff’s Monster was still lumbering around through Universal films and under copyright, Hammer films had to find a new look for their Monster, and as such, the poor soul is not visually memorable. 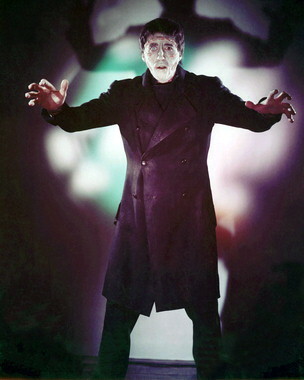 On the plus side, this was the first Frankenstein film to be made in colour, and it is used to great effect here. Originally given a X rating because of the gore contained in the film, many of the critics at the time were downright repulsed by the film. Though it is incredibly tame by today’s standards. However, the seemingly super-saturated colours, a hallmark of Hammer films, make the imagery stand out. The story is well-crafted and well put together, and is truly an enjoyable take on the Frankenstein mythos. It was also very cool to see two screen legends, Cushing and Lee, on the big screen together.